She was launched in 1969 from a Japanese shipyard as the “Shoyo Maru”. 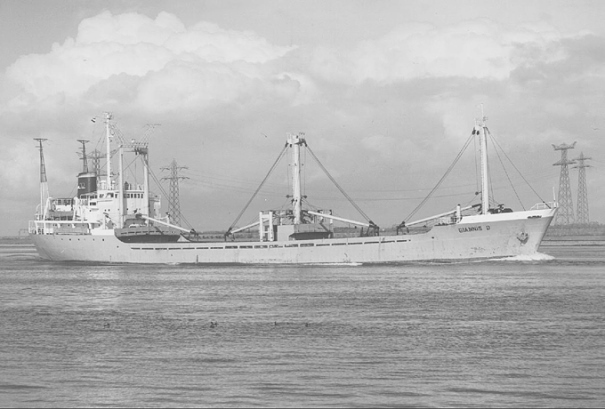 She was a general cargo vessel of 2,932 gross tonnes and a length of almost 100m. 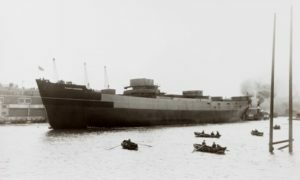 She was equipped with a Japanese-made 6-cylinder diesel engine capable of producing 3,000 bhp and a top speed of 12 knots. In 1980 the ship was sold to the Dumarc Shipping and Trading Corporation of Piraeus, Greece and she was re-named Ghiannis D, the “D” standing for Dumarc and it was painted onto her funnel. Once she struck the reef and sank, she was declared unsalvageable. 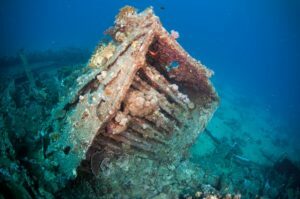 She remained on the reef for six weeks during which time her structure was badly damaged and eventually she broke into two and sank. The bow section remained a bit longer and then it also sank. Now she is found in three separate parts on the seafloor. 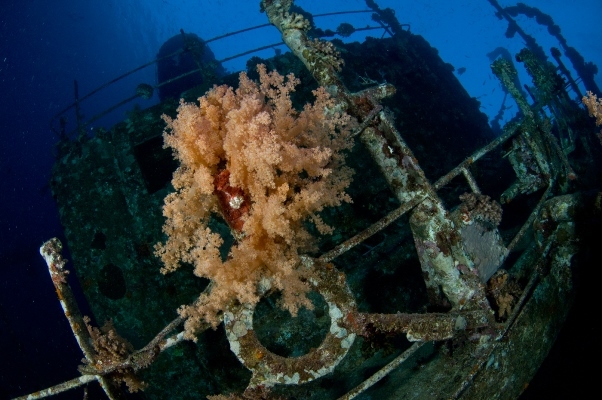 It is a very photogenic wreck and a relatively easy dive. It is best to start the dive at the stern section as this is the deepest part of the wreck at 23-34m, and move on upward from there. This part of the wreck lies on her portside and you can see the starboard screw and its blades that had been twisted by the power of the collision. The great anchor chain is coiled on the reef. There is still a ladder on the starboard side and below is the propeller partially buried in the sand. Above is visible the huge funnel with the famous “D” on it. Access into the engine room is easy and provides some excitement deep into the heart of the ship. It teems with tiny glassfish. The bridge section is large and wide open with plenty of light. Here can be found the command bridge and the residential quarters as well to be discovered. In the midsection where the ship broke into two there are still some rotted remains of the cargo of softwood she was carrying. Large groupers are the usual residents here along with snappers, jackfish, eagle rays and even sharks. This section of the wreck is abundant in parrotfish. The bow section rests on its port side with the decks facing away from the reef and the main mast lies parallel to the sand now without touching the ground. Hard and soft corals colonise this part of the wreck and lots of reef fish make it their home. A large Napoleon wrasse is often seen around here. In May, 1941 the Thistlegorm was being loaded with war supplies in her home port of Glasgow. She was to carry huge amounts and a wide array of military cargo including land mines, shells, ammunition, weapons, trucks, armoured cars, motorcycles, trailers, vehicle and aircraft spare parts, radios, rubber boots and a whole lot more. There were also a couple of railway engines, tenders and water carriers for the Egyptian Railways. She joined a large convoy and headed for Alexandria. The Axis Forces having occupied almost all of the northern Mediterranean coastline, the convoy followed the safer route to Alexandria which was via South Africa. After sailing north along Africa’s eastern coasts, the convoy arrived in the Red Sea. When arriving at the entrance to the Gulf of Suez, Thistlegorm was assigned “safe anchorage” and was to wait for further information. They settled in to wait for clearance to proceed through the channel to Alexandria. The length of wait was dependent on several factors such as aircraft activity, cargo priority and the time the vessels had been waiting already. Thanks to two vessels colliding in the gulf and virtually blocking the way through, Thistlegorm was forced to wait two weeks, standing idle. German night-flying aircrafts were alerted to possible large-sized vessels in the Red Sea. On October 5, 1941 at about 11pm two aircrafts left their base in Crete and headed for the Egyptian coast. Their mission was to seek and destroy. Just as their fuel levels were getting to a critical low and they thought their mission was fruitless, the Germans noticed a ship at anchor. 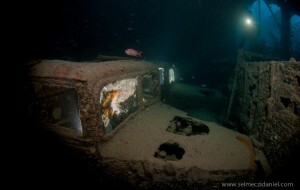 One of the pilots dipped his plane low and approached the Thistlegorm, dropping his bombs right over the bridge. The bombs detonated the ammunition cargo and the explosion ripped the ship open. The vessel began to sink quickly and the crew speedily abandoned the ship. 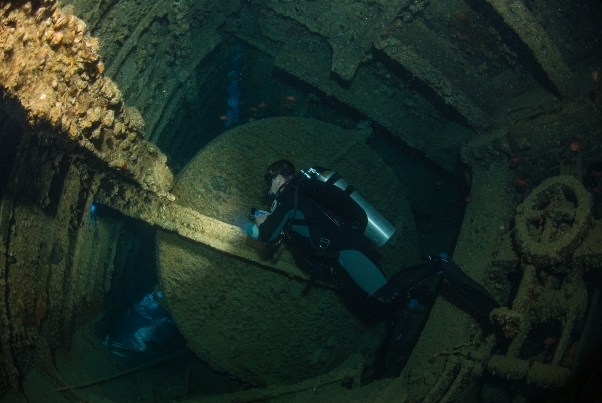 The Thistlegorm sank at 1:30am on October 6, 1941. In all, 9 people lost their lives. The Thislegorm was initially discovered by the legendary Jacques-Yves Cousteau in 1956. She sits on the seabed at 28m in an upright sailing position. The very top of the structure is only 12m from the water surface. She is one of the most sought-out wrecks in the world and with reason. The holds are still laden with cargo. 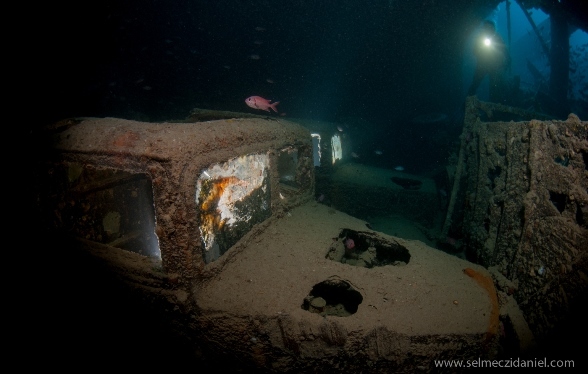 Divers can discover the tons of equipment such as jeeps, trucks, tires, motorcycles and alike and easily imagine the life onboard this awesome vessel. Around the vessel there also items that were ejected from the cargo hull following the tremendous explosion. There are tanks, towing equipment, boxed ammunition and weapons. Access is easy through the blasted-out bridge area. The crumpled decking folding out as an open tin can is still as it had been after the explosion. The image tells of a devastating event. Vehicles are parked in the hold as if waiting to be unloaded. On the starboard side besides the vehicles, other items can be found like small arms and weapons. On the stern two deck-mounted guns are still in place and are best viewed from below. Usually there is a current but it can get quite strong coming in from the north. Groupers, jackfish, tuna and the occasional black-tip shark are just a few of the larger marine life visiting this place. The usual reef fish and creatures are also present and provide a nice distraction from the wreck. 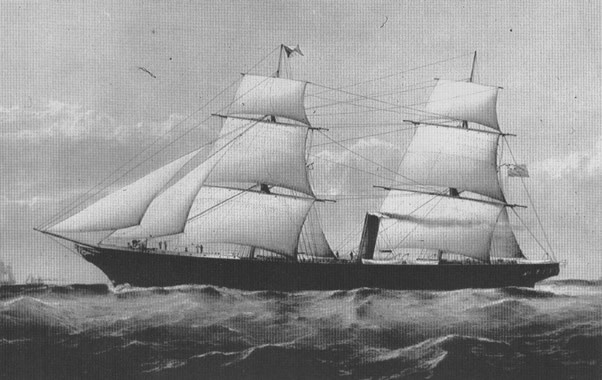 The Carnatic was built in London and launched in 1862. She was a hybrid sailing and steam-engine vessel with two masts and a central coal-fire boiler. She weighed 1,776 tons and had a length of 90m. She was operating between Suez and Bombay. Before the completion of the Suez Canal, vessels unloaded their passengers and cargo in Alexandria which were then transferred to Suez on land. There another boat waited for them, in this case the Carnatic, bound for Bombay, with 34 passengers, a crew of 176 and a cargo of bales of cotton, wine, royal mail, copper sheeting and £40,000 in gold coins. On September 12, 1869 the Carnatic sailed out of Suez under the command of Captain Jones and began her voyage to Bombay. Captain Jones navigated the treacherous waters in the Gulf of Suez. The headlands and islands along the way were visible in the clear night. However early in the morning, breakers were seen by the crew as the boat was getting near of Shadwan Island. It was too late to stop and the boat struck the Abu Nuhas Reef. Although impaled by the reef, the pumps were working hard and the boat still seemed to be in good condition for the captain to keep the crew and passengers onboard. He was also expecting the Sumatra to pass them by shortly and hoped for a rescue. She did not show and despite several passengers requesting to be taken to Shadwan Island, they all had to spend another night onboard. The captain was reluctant to allow people to be taken to the island in the life boats in such treacherous waters but by the morning water was filling the boat quickly and he finally ordered the life boats to be readied. During the rescue the boat suddenly broke in half after 34 hours on top of the reef taking 5 passengers and 26 crew with her. Eventually the survivors were able to make it to Shadwan Island, about 3 miles from the reef. Finally they were all rescued by the soon arriving Sumatra. 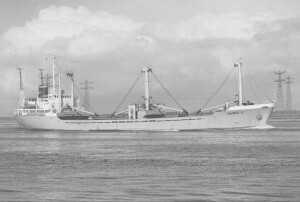 Recovery operations for the valuable cargo began a couple of weeks after Carnatic’s demise with the help of Stephen Saffrey, a diver. Most of the cargo was salvaged, including the royal mail, the gold coins and the copper sheets. Today the Carnatic lies at the base of the Abu Nuhas reef, parallel to it. She is on her port side with the bows facing east. Her stern is at about 24m on the seabed and her bow is at about 16m. The deck faces the open sea. The wreck is shaded by the reef behind, therefore it is best to dive her in the morning. The wooden structure and planking has rotted away but the steel hull remains, held together by iron supports. With the decking gone, divers are able to explore the wreck 2 decks down. The keel of the boat is virtually intact and the stern provides a view to the impressive windowed quarter deck. The boat widens from the bows toward the main body where the life boat davits are found. 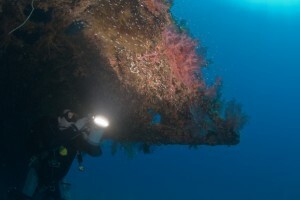 From here divers can enter the more than 150-year-old structure.